If you have applied to consulting firms between December 2015 and November 2016, we invite you to complete our end-of-the-year survey for a chance to win 1 of 10 gift cards from Starbucks ($10 value)! Please submit your survey by Wednesday, December 14 @ 11:59pm to be considered for the raffle. The survey will typically take 2 min to complete. Thank you for providing your feedback. We appreciate the time you have taken and will actively use this information to improve our services to you. 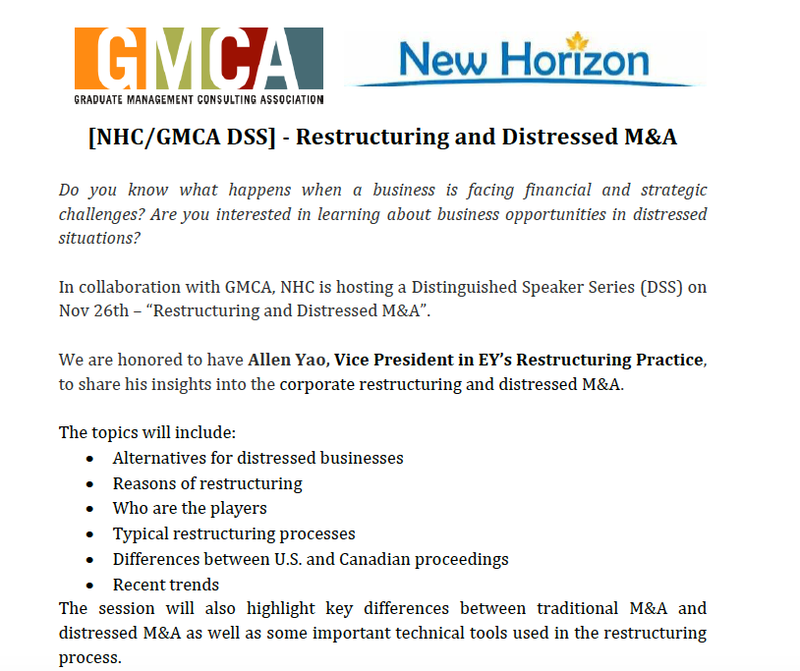 On Nov 26th, the New Horizon Career Club (NHC), in collaboration with the Graduate Management Consulting Association (GMCA) at the University of Toronto, will hold a Restructuring and Distressed Merger & Acquisition workshop. The invited speaker is a thought leader who have been working in the corporate restructuring Practice for over 10 years. This workshop offers young professionals and students who aspire to enter consulting or financial services a great learning and networking opportunity. 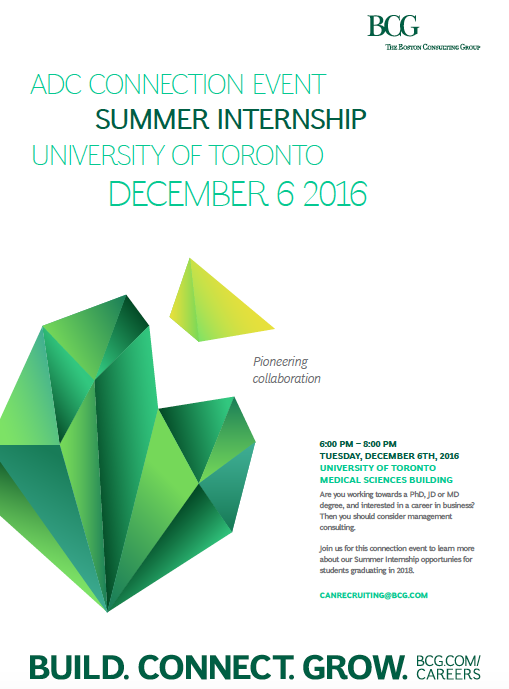 We would like to inform you that the Boston Consulting Group (BCG) is holding the Advanced Degree Candidates (ADCs) Summer Internship Connection Event on Tuesday, December 6, 6-8pm, at the Medical Science Building (MSB), Room 4279. This event is intended for advanced degree candidates (PhD, JD, and MD) interested in learning more about summer internship opportunities at BCG. Please note that this event is not applicable to Masters students. Masters students are recommended to follow the BCG undergraduate recruitment schedule. The deadline for the Summer Consultant internship application is Sunday, December 11, 11:59p.m. If you are interested in the BCG internship connection event, please sign up here. For more information about the ADC summer internship, please find the postings below.